Scholars and Researchers are known mainly for their research and peer-reviewed journal article(s) but in Asia, many of them are not well recognized because of variations in how their name appears in the published literature. Several names are shared with many other people, some names are transliterated or misspelled, and some names change over a person’s career. These variations, or ambiguities, make it very difficult to correctly identify a person’s body of work. Moreover, there are many contributions a person makes, such as peer review, patents, datasets, mentoring, that are virtually impossible to link back to the contributor and therefore impossible to cite. In addition to this, Asian researchers are found reluctant to adopt and utilize the international online platforms to manage their profiles due to the lack of technological awareness. LiveDNA became the first in Asia to realize the significance to link and cite people and their scholarly contributions. It is a not for profit, open and community oriented organization that not only assigns a unique digital identifier to researchers and professionals to protect their intellectual, academic and professional identity but also facilitates them to keep their records completely managed and updated with the help of its highly skilled and knowledgeable team and technical staff. LiveDNA is committed to open data, worldwide participation and respect to the privacy of the individual scholar or researcher. LiveDNA is dedicated to provide a transparent and improvised tracking of the research and researcher by providing each researcher a Unique Numerological ID called his/her LiveDNA. It further aims to establish a strong link between research and researchers, contributors and the work. Having a LiveDNA will help the researcher in his/her manuscript submission, grant applications, professional society membership, link with other identifiers and profiles and display it on CV, webpage and more. LiveDNA is committed to openness, transparency and the protection of scholars' privacy. Click here to register your livedna for free. Now you can share your Live DNA id with your prospective employers, potential funders, publishers, conference organizers, collaborators and institutions with the help of LiveDNA Members’ Directory. The Directory is currently having more than 1 million records of individual researchers and scholars from a diversified range of countries. 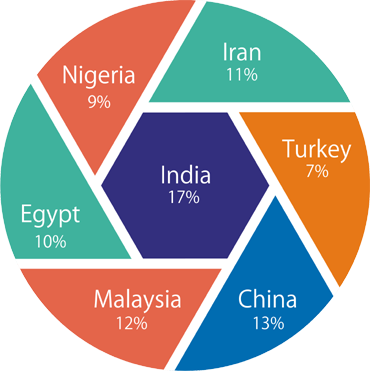 India, Iran, Egypt, Turkey, Malaysia, KSA and China are the Top Seven countries from where users have registered for their LiveDNA. Members’ Directory is open and available free of charge to individuals, who may obtain a LiveDNA identifier, manage their record of activities, and search for others in the Directory. Organizations may become members to link their records to LiveDNA identifiers, to update LiveDNA records, to receive updates from LiveDNA, and to register their employees and students for LiveDNA identifiers. Moreover, LiveDNA is committed to protect the security of information stored in the Member’s Directory. To search a record or members in the Directory please click here. Information marked as "Public" can be viewed by anyone who comes to the liveDNA website. Data marked as public will also be included in the LiveDNA Annual Report of Public Data . Information marked as "Private" can only be seen by you. It is also used by LiveDNA algorithms to help distinguish your identity from another person who may have a similar name, be in a similar field, or may be confused with you for other reasons. This information is not shared with others. Information marked as "Limited" can be seen by any Trusted Parties that you have authorized to connect to your LiveDNA Record. These connections require explicit action on your part. You will be asked if you would like to make a specific connection, and once you have confirmed, the Trusted Party will be able to see information that you have marked as limited-access. The LiveDNA is governed by a Board of Directors that consists of seven scholarly high profile individuals committed to work for researchers and save the integrity of science. They belong from different Asian Countries and steers LiveDNA towards a sustainable future by adopting sound, ethical, and legal governance and financial management policies. These board members provide foresight, oversight, and insight about the day to day and long term operations of LiveDNA. The BOD is responsible for fostering discussion and collaboration among the LiveDNA community that helps to build relationships with stakeholders, creates outreach messaging, content, and materials, and oversees meetings. The BOD is also responsible for reviewing membership policies and budget models, and investigating funding options to ensure the short and long-term sustainability of LiveDNA. The Annual Meeting of the Board shall be held at a date, time and place fixed by the Board. Notice of the date, time and place of such Annual Meeting shall be given in such form as the Board may determine.